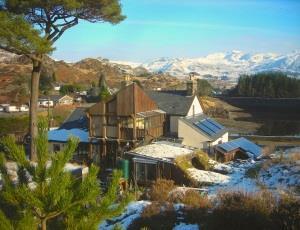 Bryn Elltyd01766 831356work Guest HouseECO....Bryn Elltyd is carbon neutral. 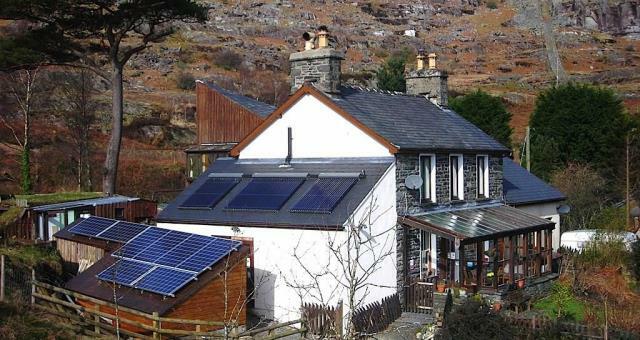 All energy inputs from renewables, located in the heart of the Snowdonia National Park at the foot of the Moelwyn mountains, this is an ideal location to explore North Wales. Walk from the house or tour Snowdonia by car or public transport, activities locally include Ffestiniog Railway and Llechwedd Slate Mines. Experience a warm, friendly atmosphere in a house that meets the criteria as an ecological and sustainable building. Solar array', green electricity, wood fires, re-used rainwater, turf roofs, ducks and artisan homemade bread each morning. Winners of the Snowdonia Wildlife gardening competition (business section) and runners up in the Wales Sustainable Tourism Award. • Some disabled wet rooms Talk to us. Daughter was a chair user. We are a great location with easy access to steam trains, Mine exploration, rambles, geocaching, and massive Zip world / Llechwedd slate quarry adventure hub all within 2miles. Lots of nature in our 1 acre award winning mountain garden plus open access to mountains. Unusually due to the mines heritage and massive hydro plants there are track...tramways and " private " tarmac road very , very locally. One gated locked road goes 1.5 miles and 100ft up to 1800 above sea level all on tarmac. first half is do able by bold with a wheel chair. John has 7 years experience teaching in schools / colleges with all many forms of disability. No 3 at multimillion pound school. Plus teenage daughter was a chair user for 7 years. We are NOT suitable for self powered. We have two wet rooms, 3 ground floor rooms and a wealth ideas from our 10 years in the area. All staff have completed 3 day first aid, qualified mountain leaders, John is canoe / kayak coach and qualified but rusty on Maketon and BSL. We have large carparks with gravel surfaces and 3 Electric car charge points. Speaks volumes.....2 marriage proposals in our Hobbit room. Set into mountainside with cosy sheep's wool lining and turf roof. WE are powered 100% by green energy and keep winning national eco competitions. Tested and graded by Visit Wales and several green organisations. No spa but 100% green electric sauna. We have an acre of mountainside / garden that wins wildlife/eco awards. 3 SSSI's in the valley. Temperate rain forest. Moss and liverwort SSSI. Night jar and adders SSSI. Local chuffs. Osprey nest site 20mins away. Beach / sand dunes SSSI 25 mins. Unique ex slate mines heritage / nature. Declared a DARK Skies area. Came 2nd to National Trust at Wales Green Energy awards. 3 Electric car charge points ( incl Tesla) for over 7 years all power by green electric. Solar thermal,,,solar electric...£20K off cosy biomass central heating. Orchard,,,veg plots...own ducks and bake bread each morning. Large dining table make from tree 10 foot from the kitchen works well with 12, 10 is better. Log burner. We can cater,,,,external caterer,,,2 hinees,Indian, chip shop, kebab shop all within 2miles. Two dining areas, two conservatories, acre of garden plus 5 benches. Wave to steam trains 50m away and get a toot. The grid shows the prices and daily availability from Fri 19 Apr 19 to Fri 26 Apr 19. It's easy to check availability for particular dates; just use the calendar to choose the check in date, select the number of nights and click the 'Search' button. Click the Book Now or Book Direct button to book the highlighted days. With Book Now the room booking will be confirmed immediately, with Book Direct the room reservation will be confirmed within 24 hours..
Evening meals and packed lunches by arrangement. 3 electric car points all fed on green electric. Tesla--Type 2--Type 1 EV points since 2012 with 100% success. Children welcome from any age. By Car: From the Blaenau Ffestiniog roundabout, take A496, after 3/4 mile (follow the brown and white signs) turn right and immediate left, following the signs for Ffestiniog Railway and Ffestiniog Power Station, down the road with white railings. Past the lake, turn left and the house is on the right. We are on th elake, last building before the hydro power station. By Train: There is a rail-link, from the main line at Llandudno Junction which is 2.59 hours with no changes to / from London Euston. From Llandudno, take the scenic Conwy Valley line to Blaenau Ffestiniog. One mile from the house - transport from the station by arrangement. Bus: Blaenau Clipper bus is 20m from Bryn Elltyd - service 4 times a day.